One of the many fabulous things that happened at the Spring Fling was that I got to finally meet JC Briar. I had heard about JC through the knitterly grapevine for quite some time, frankly I think she was a bit mythological to me... one of those west coast knitters I always hear about and never meet! When we went to the Loopy Ewe the first night to go shopping the first thing that made it into my basket was a copy of JC's new self published book Charts Made Simple. ONE because I teach chart reading often as part of my classes and would love to have a book I can recommend to my students that will help them explore the topic further and also offer support when they get confused. & THREE because maybe (just maybe) one day I want to publish my own book and I LOVE to see how other indie designer/authors take their concepts and get them to print! The book is laid out in a clear concise manner that takes you through a step by step understanding of how charts work, why they work and how to use them. Time is spent delving into using charts for cables, charts that show shaping, and reading your knitting. This last step is so important, as understanding the relationship between what is on your needles and what is on the chart is KEY. JC clarifies this in such a way that you are way more than likely to become a successful chart reader. It is truly obvious to me that JC put ALOT of energy into choosing her words, examples and diagrams to ensure that the end result was succinct and clear. There is an economy to her writing style that ensures the books clarity, and therefor, comprehension. I will not hesitate to recommend this book to my students! 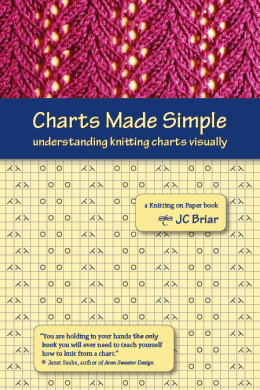 JC has generously offered to give a copy of Charts Made Simple to one of my readers... just leave a comment below by May 22 at midnight EST sharing with us how you feel about knitting charts. Do you LOVE charts? Do they make you break out in a cold sweat? Do you run in the opposite direction when you see them? Charts! I'm coming to like them. When I first started with them I'd write out what they said and knit that way, but now they are growing on me. I love charts! Many years ago I would make my own charts from written instructions. So much easier to follow!! Love love love love charts!! To the point that I pretty much refuse to knit from a pattern that doesn't have them (if it's a cabled/lace/etc project, obviously). I love charts! If I win this, I'd love to give it to my Mom...she does not share the love of charts yet! I like charts. Once in awhile I like to check something with the written pattern to be sure I am reading a chart right. Charts give me the willies! Haven't been brave enough to try one yet...I've got to get over it because I have the materials for a shawl that uses charts. I love charts and would love to know more about how to make them. Charts are what I go to when I am exhausted of stockinette stitch. I often need something to keep me excited in the pattern. I don't think I have ever used a chart that didn't have line by line written instructions as well... I could definitely use this book to help me get a better grip on them!! I find it easier to work with charts. Especially for the KAL, when I tried using the written instructions, it seemed as though you read the next stitch and then translate it to your fingers. With the charts I find it more automatic. In other words, charts make the instructions more direct, at least for me. Of course, using the tips about markers to help keep your eyes on the correct row and colors for similar cables that I learned in your class really help. So the prospect of more tips from this book is really enticing! I used to be intimidated by charts. Am currently doing my first charted project, a Cookie A sock, and find myself learning to like them. I could definitely use the insight and instruction this book can provide such a newbie chart knitter! I like to see a chart AND written instructions to kind of cross-reference them and make sure I get it. I like charts, I like that I have a visual for otherwise potentially confusing patterns and I can see how the stitches develop more clearly. I love charts. I find it helpful to have an idea of how it all fits together so that I can easily spot if I've gone off track. I am getting more comfortable with charts, but am still more comfortable with written out directions. I adore charts ... but must confess, am always most pleased to discover that the directions are provided in words, too. Sometimes, esp. late at night, I need all the help I can get! Charts used to make me sweat and break out in hives!!! Just the thought of it!! But as I have become a more confident knitter, I have come to really LOVE charts! They are invaluable to me and I think working with charts leads to less possibility of mistakes in my knitting. Learned charts early in my knitting education. They were a little ackward at first, but now I would not trade them at all. They make lace knitting so much easier. I love LOVE LOVE charts. If a pattern isn't charted, I make my own (spreadsheet and my own font). I love charts. The first lace item I made had no charts, and it was so mysterious. Once I ventured into charted territory (ha!) I never looked back! Love, love charts. They help me visualize what I am doing. I suppose that is because I have been needlepointing for years as well as knitting so the chart thingy makes sense. Would love this book. I am crazy about knitting books, too! Don't they all belong on our bookshelves? Charts can be a challenge but oh, so wonderful when the piece comes out right! I don't actually like charts, I like reading and it makes sense. But man, there is nothing easier than a chart when traveling - one piece of paper, nice and compact! I also like charts for lace since it helps me figure out what it's supposed to look like so I can "read" my knitting better. But for geometric patterns, it becomes visually cluttered and I go back to the written instructions. thank you for the opportunity to see this book. I am currently working on a lacy shawl and the chart is so easy to follow I did not even look at the written directions. Thanks for opening my eyes to the beauty of charts. Until the last few years, most of what I made didn't come with charts; mostly only written instructions. Now that I've had a few chances to use charts, I'm beginning to like them more and more! I've heard about this book, and would love to have a copy to help me even more in my charting experience! Often I will make a chart to conicide with written directions. I've wanted to get my hands on JC's book for a while now. I used to be afraid of them... after some practice I like them better than written directions. I get a visual of one row after another that I don't get with sentences. For me, it depends what I am knitting. I did a pattern with tree branches that I NEVER would have been able to do without the chart, but I'm still trying to decipher another chart that doesn't provide written directions. So many lovely comments. I want to get better at writing readable charts! I, too, have done a lot of knitting with and without. I much prefer lace and colorwork with charts. I love charts! For me, they are so much easier to follow. Absolutely LOVE charts - and dis-dis-dislike written instructions that take up pages and pages! I always lose my place with them and it takes forever to finish a row but with a chart it is so easy to read. I love charts, especially when accompanied by a close up photo of knitting. The charts with some color are the best for me, perhaps because my first experience with charts was with cross stitching. I have this book on my wish list! I love charts! I prefer them over written instructions hands down. Chart reading is definitely an important knitting skill. I am knitting my first pattern using a chart. I find it a bit confusing, but am getting used to it. I would love to win this book!!!!!!! i too love a good chart, and would enjoy learning more about how to set up your own designs using a chart. Since I took your class I've been trying really hard to use the chart instead of writing it out! Love charts and couldn't live without them! Understanding the relationship between your chart and your knitting is so freeing. Do whatever it takes to learn to read them - you won't be sorry. What a great idea for a book. I'm going to recommend my knitting guild buy this for our library. But of course I'd love to have my very own copy. Not exactly a cold sweat, but close. I usually end up writing out the instructions - I know, I know, can we say scaredy cat? The mystery KAL was my first chart! I MADE myself learn how to use it when I realized how much easier it would be. I would love this book so that I could pick up more tips for future chart knitting! I usually type out the instructions because I tend to always have to look up what the symbols mean. Would like to learn to read charts though. I actually prefer charts, since I'm a visual person, and like to be able to see what the item's supposed to look like. I get lost in the K2PC4B instructions and wonder where I was! I love charts, they are easy to read. I would so love this book. I've been knitting for a long, long time but charts do me in! I'm totally flummoxed when confronted by a chart and will avoid them at all costs (even if it means not making something I really like). I'd like to get over this and learn to love the chart!! Thanks for making this available. I have really like charts especially on a lace pattern where the written directions look like it woud take forever to do one repeat. Still, I think I am not so good as I would like to be. You taught me a class at Squam Art Workshops last year and had us read two lines of a chart. It was amazing how much this helped me! I am much, much more comfortable reading charts now and have made many patterns using them since. I much prefer patterns that are charted because of your help. I have grown to like charts (not love) but wish there was more standardization. I like it when the symbol design helps you understand what you are doing like with a cable. How do I love charts...let me count the ways. Charts make it quicker for my brain to interpret the instruction. Plus, I can see what the thing should look like. Then, I can easily note where a stitch should occur on the row. Etc, etc, etc. I have a love/hate relationship with charts. I am somewhat of a newby to charts but am an expert at the "decoding" of the written knitting language. The thing that confuses me with reading charts is the whole right-to-left, then left-to-right of some charts. That western civilization thing really runs strong in me and when I have to turn my mind around, well, let's just say I have had my share of trouble! Glad to see someone someone out there has anticipated this chart stuff! I am begining to really prefer charts! I am knitting lace shawls, I find charts much easier then written out. I would love to learn more about using them. I get confused about reading right to left, or left to right. So glad ther is now a book to help with the confusion. Truthfully I never thought I would see the words "chart" and "simple" in the same sentence without a "not" or a "never" or a "no way no how" in between them! That should pretty much tell you how I feel about charts. Friends tell me to write it all out but I fear I would lose courage not to mention interest before finishing. Sooooo if this book really delivers I will be very very interested in it and maybe even order a copy for my library knitting group. Full of hope am I! I love charts, I can knit much more quickly if there is a chart to go by rather than written directions. My husband has told me charts look like they are written in Klingon or some other alien language. I prefer knitting lace with charts, but the ones for flat knitting reading back and forth are challenging. I don't mind reading one row from r to l, and the next row from l to r; but wish the symbols on the l to r rows indicated the stitches I was actually doing, instead of the opposite of what I was doing. I seriously could use help with charts! The small repeats I can handle, but a real lace shawl? I have heard others rave about this book, too. Charts - the language of knitting - I love learning new languages, how symbols represent ideas and information. I want to learn more in depth how the language works and be able to translate ideas into written form. How did the knitting cultures where lace is so important pass the information on? The whole concept is amazing. I want to love charts, but I don't trust myself reading directly from them yet. I like it when patterns have both written directions and charts so that I can double check to see if I am reading the chart correctly. I know I should go cold-turkey and just use the charts, but that would necessitate a slower knitting pace for awhile. This book might be the perfect thing to help me along! Charts scare me a little and I prefer to knit from written directions. Having said that, it would be great not to be handicapped in that way! Charts are new to me, still would like to have written words to verify that my interpretation of the chart is correct. Guess some day I will have the confidence in just reading the chart. I LOVE working from charts, and will avoid using a pattern that only uses worsd. My goal--which I think this book would help--is to learn how to write charts. I love working with charts and seeing the pattern develop. I often write my own when there is none for a pattern so that I can visualize it. I prefer using charts to using written out instructions. Sometimes remembering which symbol goes with which stitch confuses me, and I've met one or two confusing charts, but overall, they really help me see what my knitting. I like charts but I sometimes get the rows mixed up (written instructions, too!). I love working with charts, although recently I learned how much I have yet to learn about them, me and my knitting! The learning had to do with how one reads charts differently when working in the round vs flat. Having the clarification pointed out to me made a HUGE difference to the lace beret I was working on: suddenly the pattern made sense. Duh! And, PS, I heartily recommend the Knitting Chart Keeper that's available through KnitPicks for keeping track of what chart row one is on! Charts about do me in. Would love the additional help this book would provide! I've never used a chart. Not once. It's the one big hurdle keeping me from knitting the pair of intricate fair aisle mittens I've been wanting to make/own/wear. It sounds like this book is exactly what I need to get over this phobia, thank you for writing a review on it! I've never heard of it before. I love charts and would likely give up knitting lace without them. I'm a very visual person and can "see" the lace with the chart. Something I cannot do with written instructions. I really want to create my own. My only complaint is inconsistency in what symbol means what stitch. It seems that every chartmaker wants her own legend. I'm still very much a novice with charts. Prefer patterns that have both kinds of directions so I can "check my work"! If a pattern does not have a chart I usually try to make my own, but I think I make it harder than it should be. Very long lace patterns with no chart I skip entirely. I would like to be more comfortable reading cable charts. This book looks really interesting. I love using charts and am constantly looking for new information to make the knitting easier. I am somewhat intimidated by charts, but would love to learn to use them. I love knitting from charts and even have converted written instructions to charts. I really like knitting from charts. I think a book would be helpful because it would make it easier. I love charts, particularly when they're well designed and you can follow how the stitch stacks up! I used to fear charts, but now I've grown to love them, especially because you can easier visualize what the pattern will look like. I an so scared of the charts. People with more experience say that are very easy to work with but I just can't get them! Maybe this is the right giveaway to enter!!! I don't love them, but I'm not scared of charts either. They are usually nice and clear. There are so many lovely patterns but I find charts difficult to 'read'. A book to make the process easier would be wonderful. I do try to expand my knitting knowledge and lace knitting is on my list of things to conquer. So far I am a 'written instructions' knitter but so want to be able to use charts! I'm getting better with charts. I like patterns that have charts and written out directions. That way I can read the chart; and if I have a problem with it, I can double check the written out directions. I don't have a lot of experience using charts, but I'd love to learn more about them. I love that charts are such a good road map. Being able to see what's coming up and where you've been as well as figuring out where you took a wrong turn is so helpful. I'd like to get into pattern writing, so I'd love to win this book. I've never used charts - they scare me a little! I'd love to get used to them though - would save me writing out chart only patterns into line by line writing! I'd love to love them! i love love love charts!